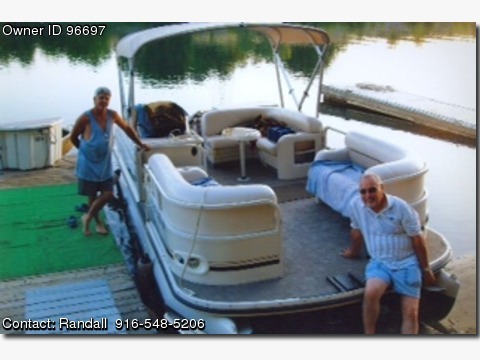 Please call boat owner Randall at 916-548-5206. This is a well-kept and loaded boat that is located in Sacramento area. Will transport any where in California once purchase is made. Full Bimini, full enclosure screen and plastic wind/rain shields. Includes Mercury 115 4 stroke engine with 95 hours, Live well tank set up for fishing, two swivel fishing seats in stern, Tilt Steering, AM/FM/CD w/four speaker stereo system. carpet, Coat Guard pack, Pop up rest room, Front sleeper with bow bench, Boarding Ladder, Docking Lights, Full enclosure, Sonar, depth finder, Lowrance X-50DS Fish Finder, and 85lb thrust Minkota Trolling Motor, rod holders, Portable Table, cooler, 3 batteries, storage, dual axle trailer, original owner, prof. maintained, Made docking ramp that stores under bow of boat and slides in and out.